University spokesman Al Cubbage speaks to protestors Tuesday afternoon. Cubbage reiterated the statement issued Tuesday morning by the Title IX Coordinating Committee. Northwestern officials responded Tuesday morning to a petition drafted by faculty asking the University for more transparency in cases of sexual misconduct. NU’s Title IX Coordinating Committee, which consists of 13 administrators, including Dean of Students Todd Adams, issued a statement agreeing termination could be considered as a potential sanction for violation of the University’s ban on faculty-student relationships, which are expressly prohibited under a new policy introduced in January. A Medill junior filed a lawsuit Feb. 10 alleging NU had violated Title IX of the Education Amendments of 1972 by not sanctioning philosophy Prof. Peter Ludlow after she accused him of sexual assault in February 2012. The University responded to the lawsuit Feb. 21, denying any Title IX violations. 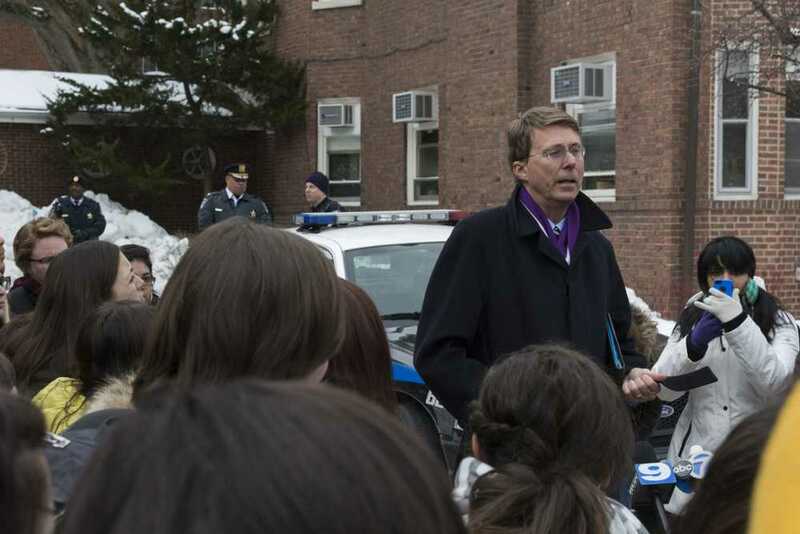 Through his attorney, Ludlow has also denied the student’s allegations. The Change.org petition, drafted in response to the University’s answer to the lawsuit, had received nearly 1,500 signatures as of Tuesday evening. The petition was addressed to NU’s Board of Trustees. Students protested Tuesday outside the office of Sarah Mangelsdorf, dean of Weinberg College of Arts and Sciences, hours after the committee released its statement. The protest was not in direct response to the statement, but was planned Monday evening as a way of speaking out against what call a lack of transparency by the University when handling sexual assault and misconduct. “We would like Northwestern to go above and beyond what is required by Title IX,” protest organizer Laura Whittenburg, a Weinberg junior, said at the demonstration. The faculty petition requests sexual assault survivors be notified of the both the findings and the sanctions imposed following an investigation into a sexual assault complaint. Currently, survivors are only notified of sanctions that directly affect them, the committee said. “The Committee appreciates the petition’s suggestion that survivors be notified of all sanctions imposed, and will make it a priority to consider and clarify practices, in light of applicable confidentiality laws and policies, whereby sanctions in sexual harassment or sexual violence matters would be disclosed to survivors,” the committee said in the statement. Faculty also highlighted the need for the findings from sexual assault complaints to be disclosed in a professor’s personnel file. “Make a commitment that professors who have been determined to have committed sexual harassment, violence, or abuse shall not be ‘passed on’ to other universities,” faculty asked of the Board of Trustees in the petition. The committee said this request was already in practice. “The University responds to requests for information about its employees from prospective employers, including information on University investigations, based on the nature of the inquiry and in accordance with applicable laws,” the administrators wrote in the response. Ludlow is currently a candidate for a job at Rutgers, The State University of New Jersey. According to his resume, Ludlow worked as a visiting professor there in Fall 2012, after the internal investigation had been conducted. “This was not brought to our attention by either the candidate or his employer. We are looking into this matter thoroughly including requesting all relevant information to fully evaluate his candidacy,” Rutgers spokesman Greg Trevor told The Daily shortly after the lawsuit was filed. Rutgers spokesman Ken Branson had no further comment Tuesday. The petition also requested the release of a “Resolution Agreement” that NU allegedly entered with the Department of Education’s Office of Civil Rights in 2012. The University’s statement denies NU was a party to such an agreement or that the agreement exists.